If you love oodles of noodles, you’ve come to the right place! From Japanese restaurants to Thai eateries, there are plenty of noodle places in West Virginia to indulge your carb craving. Whether you’re in the mood for ramen or pho, you’ll find it at our favorite noodle places in the state! Nestled inside the Capitol Market on the south end of Charleston is a gem of a restaurant tucked away from general knowledge. Inside this amazing marketplace alive with colors and aromas and tastes you’ll find the Sushi Garden, a place that offers freshly made treats like spicy wraps, rolls, nigari, and party platters to take home, all made by the talented hands of Chef Mike. Part of Capitol Market since 2015, Chef Mike brings his experience directly from China and has even created a special West Virginia roll for customers. Newly added to the menu is several flavors of ramen served in large bowls and best eaten with chop sticks and a spoon. If you love sushi and noodles, stop by the next time you’re in the capitol city. Morgantown, West Virginia is the place where you’ll find Yama Japanese Restaurant, an authentic Asian eatery specializing in fresh ramen, tuna bowls, and udon noodles. The place is small and the menu isn’t large, but what you get there is delicious, hot, and fresh. It’s the kind of food that fills you up and brings a smile to your lips. Highly recommended on social media sites, this is truly a hidden gem in the city. You wouldn’t think you could find authentic Thai food in an Appalachian state, but you’ll be pleasantly surprised when you visit Thai Valley Kitchen in Hurricane, West Virginia. Each chef is from Thailand and brings the traditional, culture, and style of cooking to the table, literally. Open every day, the Thai Valley Kitchen has one goal—to serve delicious affordable food. They accomplish this by offering a variety of menu options that include specialties like lo mein noodles with cabbage, water chestnuts, onion, bean sprouts, carrots, and corn and one of their most popular dishes, Drunken Noodles, made with stir-fried rice noodles, broccoli, peppers, onions, mushrooms, and basil in a slightly spicy chili sauce. If you want good flavor for a great price and you love Thai food, this is the place for you. Do you love curry dishes and noodles? Then Surin of Thailand in Huntington, West Virginia is the place to go. Only the best and freshest ingredients go into each item prepared here, and the chefs use original recipes from Thailand that have been passed down for generations. You’ll find the servers pleasant and helpful in selecting the foods and the heat levels you want. 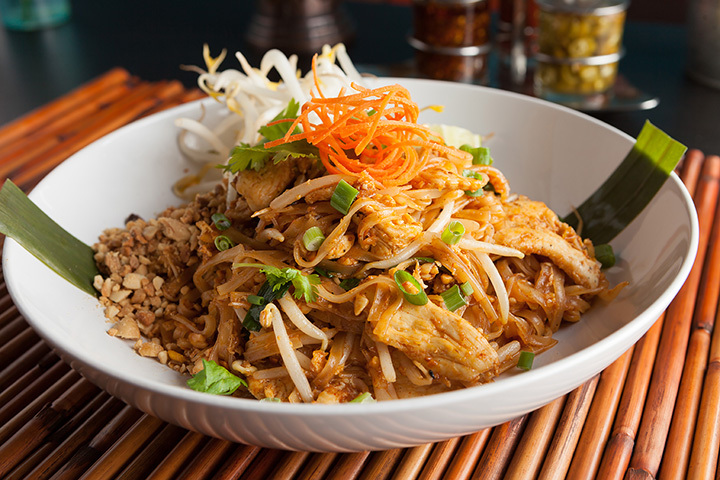 Some of their most popular noodle dishes include Pad Woon Sen with mung bean noodles, egg, onion, zucchini, tomato, carrots, and Chinese cabbage, and Phad Thai, made with thin rice noodles, shrimp, chicken, scallions, peanuts, and egg. Open for lunch and dinner every day, this establishment is child-friendly and smoke free. Joining the ranks of popular noodle places, Pho Hung opened in 2017 and has quickly become a favorite place for Vietnamese cuisine. With inspired flavors and textures that combine crunchy and spicy, you can choose your favorite meat or no meat at all in one of the large-portioned pho noodle dishes. Very reasonably priced, you can’t go wrong by eating here. Considered a bubble tea café, The Green Pineapple in Shepherdstown, West Virginia is that and so much more. Featuring authentic Asian and Korean foods with a twist, you can find all your favorites here like spicy pork belly sliders, delicious pho, and a house quesadilla with a surprising punch of flavor from the kimchi that’s added. Definitely worth trying! Tucked away in the sleepy coal town of Oceana in the southwestern corner of the state, Asian Taste is truly a hidden gem. The dishes here are inspired from Asian and Chinese culture. Great value for the money, you can find favorites like Hibachi shrimp or chicken, beef and broccoli, and several varieties of lo mein and other noodle dishes. Everything is available for take-out, and the restaurant is open Monday through Saturday from 11 a.m. until 10 p.m. and on Sunday from noon until 10 p.m.